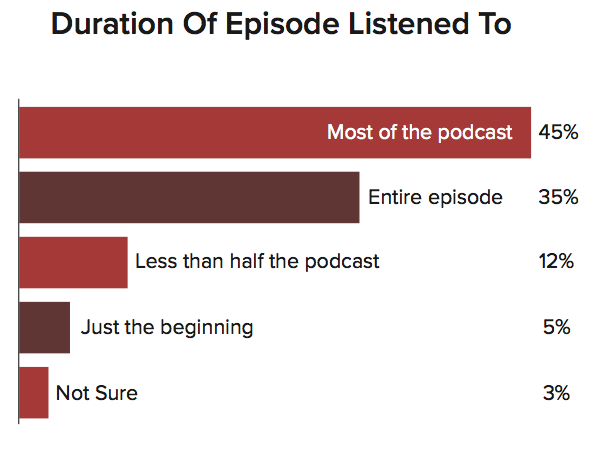 As attention spans shrink, long-form podcasting explodes in popularity. A recent study from Edison Research shows that Americans crave well told stories. Emerging technologies continue to disrupt every aspect of our day-to-day lives, from how we travel to how we shop and how we entertain ourselves with books, movies and TV. In the same way, Americans are abandoning the radio for podcasting and the freedom of on-demand listening on smartphones and smartspeakers. For 2018, The Infnite Dial tracks and covers new research on mobile behaviors, Internet Radio, Podcasting, Social Media, Smartspeakers and more. 73 million Americans listen to podcasts each month, a number that will continue to grow steadily for the foreseeable future. Compared to the U.S. population at-large, podcast listeners are smarter and make more money than the rest of the country. In an age of distraction where Americans shift between screens at a rate of 21 times an hour, podcasting continues to capture imaginations with more listening, more shows followed and more time spent with the medium.